We want students of the highest caliber who are eager to broaden their minds, develop their own unique professional identity, and use the assets of our School and University to figure out how to create value in whatever career they choose to pursue. NYU Stern is introducing a new Essay 2 to its full-time MBA application for Fall 2013 applicants, the first major change in the essays in six years. The question will assess an applicant’s fit with the Stern mission and mindset about creating value in an environment of increased ambiguity. The School believes these qualities are essential to lead in today’s global business environment. “This isn't the typical long-term career question. We want applicants who think deeply and broadly about their long-term goals and how they can make an impact,” said Isser Gallogly, Assistant Dean, MBA Admissions. “Ultimately, we want to select students who consider multiple approaches and are comfortable with non-linear thinking. We promote this type of thinking in our MBA experience because we believe it is the mindset the business leaders of tomorrow need to succeed." Stern will keep its well-known “Personal Expression” Essay 3 that invites applicants to describe themselves to their future classmates, using almost any creative medium, including video. Visit NYU Stern’s website for more information on admissions and the full-time MBA program. 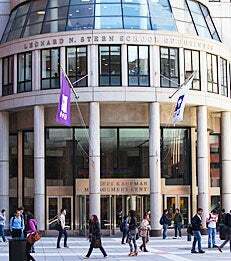 Located in the heart of Greenwich Village, New York University Stern School of Business is one of the world’s premier research and teaching institutions. NYU Stern offers a broad portfolio of graduate and undergraduate programs, all of them informed and enriched by the dynamism, energy, and resources of one of the world’s business capitals. Follow NYU Stern on Twitter at @NYUStern and find additional information at www.stern.nyu.edu.